No scholar has devoted more of her career to the works of Joris Hoefnagel (1542–1600) than Thea Vignau-Wilberg. Nearly a half a century ago, she published her dissertation on the manuscripts that Hoefnagel produced during his tenure at the Bavarian and Rudolphine courts. In the intervening years, she has authored and co-authored some thirty articles, books, and exhibition catalogues, addressing not only the works of Joris but also those of his son Jacob Hoefnagel (1573–1623/33). Yet this body of scholarship, buttressed by scrupulous archival research and laborious efforts toward recovery of the works themselves, is largely written in German and published in venues that have failed – in most cases – to do justice to the splendor of the visual material under discussion. With her new book, Joris and Jacob Hoefnagel, issued simultaneously in both German and English, Vignau-Wilberg has given us a lavishly illustrated overview, which will remain the starting point on these two artists for a long time to come. Her title echoes that of Eduard Chmelarz’s foundational 1896 article, the first to unite van Mander’s still essential biographical narrative with archival documentation and analysis of the miniatures and drawings that were known at the time. Chmelarz already signaled that Joris was the greater artist, and Vignau-Wilberg concurs. Only sixty or so pages of this weighty tome are devoted to Jacob; indeed, only a small number of works can be attributed to him with confidence, and many were produced under Joris’s shadow. Two among them are stunning cabinet miniatures, now in the Musée du Louvre and the British Museum respectively, which Vignau-Wilberg convincingly upholds as collaborations between father and son (nos. B1–B2, pp. 483–84). One might lament that this catalogue raisonné does not include a comprehensive list of sources and documents related to the two Hoefnagels, but its already unwieldy size may have made such an inclusion untenable. In addition to updated biographies, Vignau-Wilberg provides for each artist a list of works now known only through the textual record, and a short appendix indicates a handful that she takes to have been “incorrectly” attributed to either Joris or Jacob. As she acknowledges, this section too is not complete; it includes only the attributions that she considers most critical to refute, which she asserts “must once and for all be negated” (p. 519, n. 1). I will leave such matters for others to debate and turn instead to a few comments about the discussion of the elder Hoefnagel and his autograph works, which constitute the heart of this volume. The single largest section of the book surveys Hoefnagel’s extensive contributions to Georg Braun and Frans Hogenberg’s Civitates orbis terrarum (1572–1617), a city atlas for which Jacob also produced a handful of views, and which is well known as one of the seminal cartographic publications of the age. Vignau-Wilberg does what would only be possible in a tome such as this one: she brings together reproductions of the published prints with the many surviving drawings associated with the project, including the compositions in ink and wash that Hoefnagel provided for engraving, as well as the smaller group of schematic drawings squared for transfer (held today in Vienna’s Österreichische Nationalbibliothek), which speak to the translation process from drawing to print. This is invaluable material for any future scholar wishing to engage with Hoefnagel’s involvement in the Civitates and the field of cartography at large, one that complements the exhaustive carto-bibliography of the atlas itself (not cited by Vignau-Wilberg) that Koeman’s Atlantes Neerlandici has already provided. However, the subtitle to this book, “Art and Science around 1600,” also suggests that its author wishes to make a grander claim about Hoefnagel’s contributions to the field of natural history and his place within the intellectual world of his day. We need not dwell on the anachronism of term “science” in this context, though perhaps “knowledge” would have been a more apt choice in counterpart to the word “Wissenschaft,” which is employed in the subtitle to the German edition of Vignau-Wilberg’s volume. As she rightly concedes in her very brief subsection on the question (pp. 14-15), Hoefnagel’s select observational study of natural specimens was met in his oeuvre by a deep investment in the classical tradition, emblematic wisdom, natural philosophy, and spiritual concerns. In other words, Hoefnagel was a humanist by today’s terminology, and even to describe him as an individual driven by “scientific interests” (p. 15) is perhaps a bridge too far. What is more puzzling, and more pressing to consider, is the author’s titular emphasis on the moment “around 1600” at the expense of her subject’s earlier years. Hoefnagel participated actively in the pursuit of art and “science” at Rudolf II’s court only during the last decade of his life, yet many of his nature studies and cartographic explorations long predate this period. Already in the 1570s, for example, Antwerp was a thriving center for the study of natural history and many other branches of knowledge, and among the recent scholarship omitted from Vignau-Wilberg’s bibliography is that of Tine Meganck and Marrigje Rikken, which has addressed the importance of the Antwerp milieu to Hoefnagel’s creative and intellectual pursuits. Vignau-Wilberg’s attempt to date Hoefnagel’s Four Elements manuscripts (pp. 99–103) to his tenure at Rudolf’s court likewise does not convince this reviewer, and Lee Hendrix’s developed and careful arguments about the longer gestation period of those volumes remain difficult to refute. My own forthcoming book has much more to say on this question. Of course, none of this criticism diminishes the enormous contribution that Vignau-Wilberg has made to our collective knowledge of Hoefnagel. 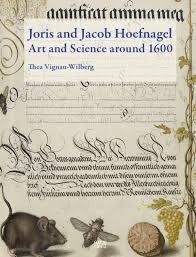 If Joris and Jacob Hoefnagel endeavors to accomplish more than it achieves in terms of enriching our understanding of the complex worlds to which these artists and their works belong, it nonetheless offers a welcome resource for future scholars seeking a way into their oeuvres. No catalogue raisonné can do everything, and this one laudably sets the stage for more to be done. T.A.G.W. Vignau-Schuurman, Die emblematischen Elemente im Werke Joris Hoefnagels, 2 vols., (Leiden: Universitaire Pers, 1969). Eduard Chmelarz, “Georg und Jakob Hoefnagel,” Jahrbuch der Kunsthistorischen Sammlungen in Wien 17 (1896): 275–90. Cornelis Koeman, Koeman’s Atlantes Neerlandici, compiled by Peter van der Krogt, vol. 4.1 (’t Goy-Houten: HES Publishers, 2010), 35–261. Tine Luk Meganck, Erudite Eyes: Friendship, Art and Erudition in the Network of Abraham Ortelius (1527–1598) (Leiden: Brill, 2017), and Marrigje Rikken, “Dieren verbeeld. Diervoorstellingen in tekeningen, prenten en schilderijen door kunstenaars uit de Zuidelijke Nederlanden tussen 1550 en 1630,” (Ph.D. diss., Leiden University, 2016). Lee Hendrix, “Joris Hoefnagel and the Four Elements: A Study in Sixteenth-Century Nature Painting,” (Ph.D. diss., Princeton University: 1984). Marisa Anne Bass, Insect Artifice: Nature and Art in the Dutch Revolt (Princeton: Princeton University Press, forthcoming 2019).